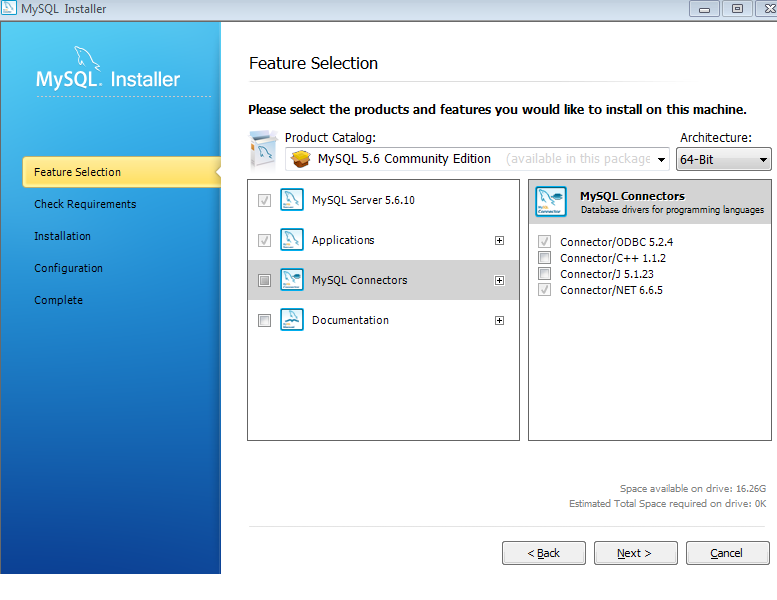 MySQL is definitely one of the most popular database systems. It is free and open-source, and comparably easy to install and use. The all-in-one installation package makes the installation quite simple. 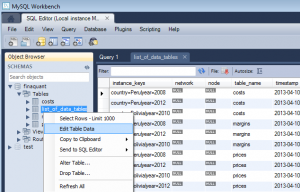 This package also includes MySQL workbench for tasks like executing SQL statements and database administration with a nice graphical user interface (GUI). PersistentTableArray class of the non-commercial .net library finaquant® protos can be connected with a relational database like MySQL (or Microsoft SQL) in order to read or write in-memory tables from/to the database together with their instance information. You may find some interesting articles in internet if you search for MySQL versus SQL Express. 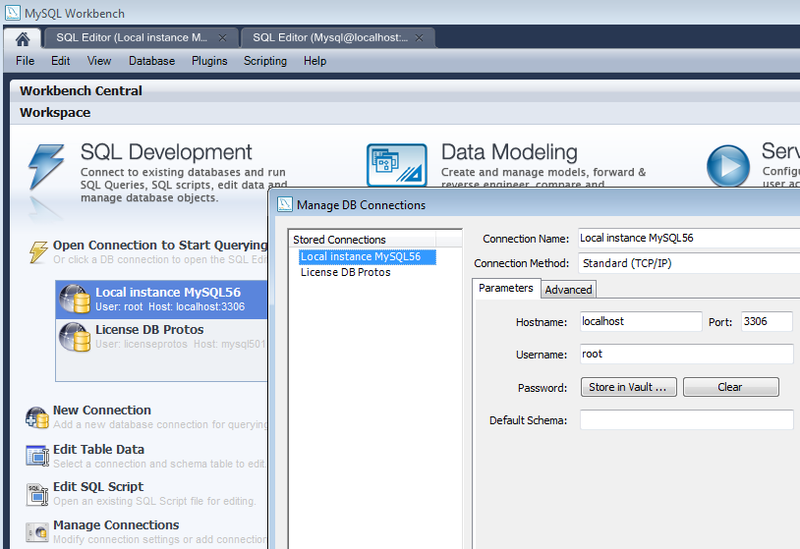 PersistentTableArray and DataStore classes of finaquant® protos that are responsible for the database connection don’t need many widgets and gadgets of a sophisticated commercial database; they are based on most basic standard (ANSI) SQL statements for reading or writing complete tables. So technically, MySQL database is more than enough for persistent table arrays with the advantage that it doesn’t have the storage space limitations of Microsoft SQL Server Express. You will also need Microsoft Visual Studio (VS) to run the demo function for persistent table arrays included in the VS project file FinaquantProtosStarter that you can download at the product page of finaquant® protos. Connectors: You need only Connector/ODBC. IMPORTANT: If you are working on a 64-bit computer you need to download and install 32-bit version of the ODBC connector separately, because even a 64-bit machine may need a 32-bit connector. 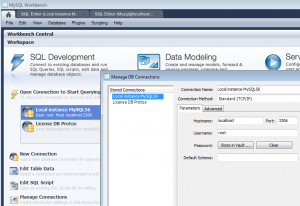 Download ODBC Driver for MySQL (32 bit version, mysql-connector-odbc-5.2.4-win32.msi). In the main window you can click on Manage Connection to update or create database connections. You don’t need to change here anything; you can set a password to the default user root if you want. 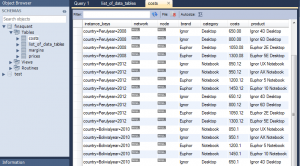 Select your local connection and click on Open Connection to Start Querying to open the SQL Editor window. 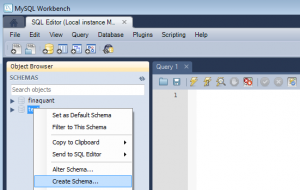 Right-click on an existing database (initially test only) and select Create Schema to create the new database named finaquant. 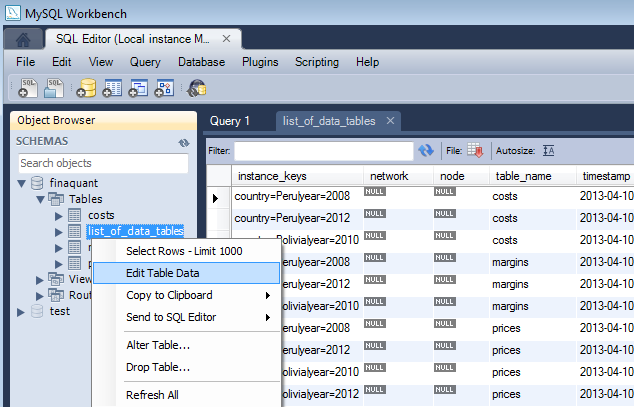 You have now your new database which is all you need for Persistent Table Array. 6) Set the database connection string in the demo function Persistent_Table_Array() in code file Demo.cs and run the method which calculates price tables for given instances of cost and margin tables. C) Out-comment all other demo functions, un-comment DemoFunctions.Persistent_Table_Array() in the code file Program.cs and press F5 to run the demo function. 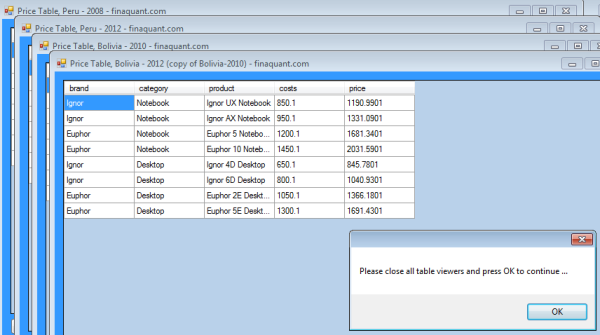 7) Check the database to see which table are created. 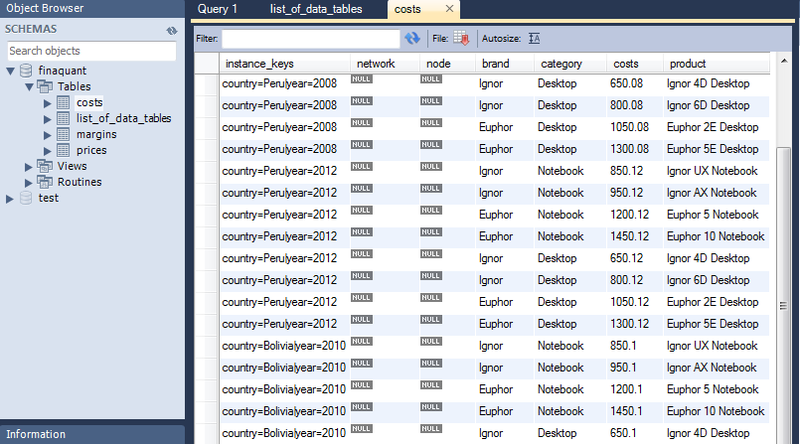 A single table of the database stores multiple instances of in-memory cost tables.